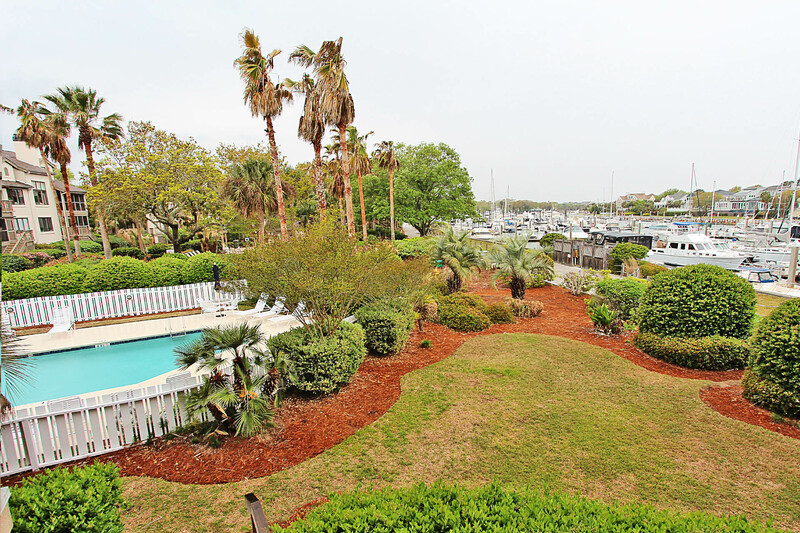 This beautiful condo is a boaters paradise with breathtaking views of and easy access to the Wild Dunes Yacht Harbor and the tropically landscaped community pool just steps from your back door. The kitchen boasts granite counter tops and stainless steel appliances, a fantastic kitchen to cook and entertain in. Boat slip rentals are available through the marina store. This property features a large, open living area with 9 ft. ceilings which leads to a nicely furnished screened porch overlooking the pool and waterway with direct pool access from the porch. It also features wood floors throughout, a fully equipped kitchen, laundry room, and dining area. With this property, you also have access to wireless internet service, Covered parking for one right at the steps to your screen porch and a community elevator. VCR/DVD player. Three flat screen TVs. Bedroom 1:2 Twins; Shares full bath with hall; Flat screen TV. Bedroom 2: King; Private full bath; Flat screen TV, sliding doors to screened porch. Living room: HDTV with DVD and VCR, sliding doors to screened porch. Kitchen: Large open plan, granite counter tops, island. Dining: Table to seat 4 with extra seating for 3 at the island. Laundry: Laundry room with washer and dryer. Patio: Screened with stairs leading to the pool, garage. *This is a Sunday-Sunday rental from 6/2/19 to 8/25/20, 3 night minimum in off season* Please note that this property has a strict 2 vehicle capacity. If you want a comfortable, relaxing place to stay, this is it! The view of the channel is breathtaking, there is a lovely walk to the Marina, to grab a great breakfast or lunch, or walk to the restaurant for drinks & a meal with friends. It’s a short walk to the beach, for swimming or collecting shells! If you have a rainy day, the screened in porch is ideal to still enjoy the day. For those who like to cook, this condo has everything you would ever, ever need! The beds are so comfortable for a good nights sleep or afternoon nap. The underground parking is a plus, and if you need to take up many items, use the handy elevator. Can’t say enough of the most enjoyable vacation spot! Love the place! Love the place! Recommend it to anyone! Best master bedroom bed in the world! This place has every pots & pans, every cooking utensil you would ever need! Two sets of dishes and silverware, high ceilings, wonderful screened in porch, spacious, and love the decor! You’re missing something if you don’t rent this place, during spring , summer & fall months. Beautiful view of the water & yachts, great fishing! Hi Thank you so much for taking the time to do a review. I know the owners love having you at their condo and all of us at Island Realty love seeing you come back every year. We love everything about this condo, great layout, high celinibgs, pleasant furniture, and the king size bed is to die for. This is the best equipped kitchen we have been in, from plates, pots & pans, every utensil you’d ever need. A very comfortable front screened in porch to look at the lovely view. 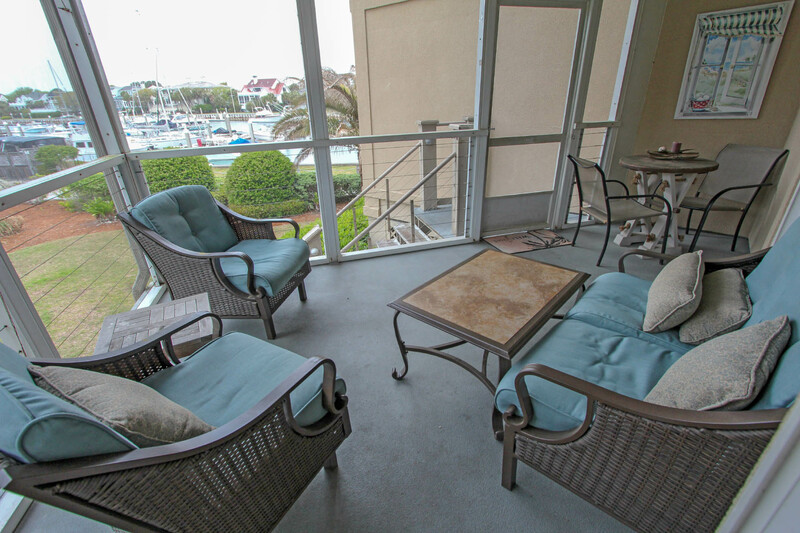 Within walking distance to the Marina and a short walk to the ocean. Hi *** Thank you so much for taking the time to do a review. I know the owners love having you at their condo and all of us at Island Realty love seeing you come back every year. Hi Mr. Colby Thank you so much for taking the time to do a review. I know the owners love having you at their condo and all of us at Island Realty love seeing you come back every year. Huge, updated condo. Great view. Nice location. Furnished nicely. Fit our family gathering perfectly. Thank you for taking the time to write such a kind review. We passed it on to the owner, and she let us know that they are going to be doing further updates early in 2019, so hopefully you will be back to enjoy them! The unit was in great shape and clean. Didn't have any issues with the property and check in was a breeze. Thank you for taking the time to leave a review and we look forward to having you stay with us again soon. This condo at Yacht Harbor is really nicely decorated and furnished. We stay at Wild Dunes quite often and this was one of our nicest rentals. We only used the Master Bedroom and the bed there was very comfortable. Thank you for taking the time to write a review. We are glad you had a wonderful stay and we look forward to having you back with us soon. Condo even better than pictured. Roomy, nicely decorated, quiet, wonderful pool as warm as bath water. Spent many hours on the screened porch relaxing! Thank you for taking the time to write a review. We do hope that you won't wait too long before returning for another relaxing stay! 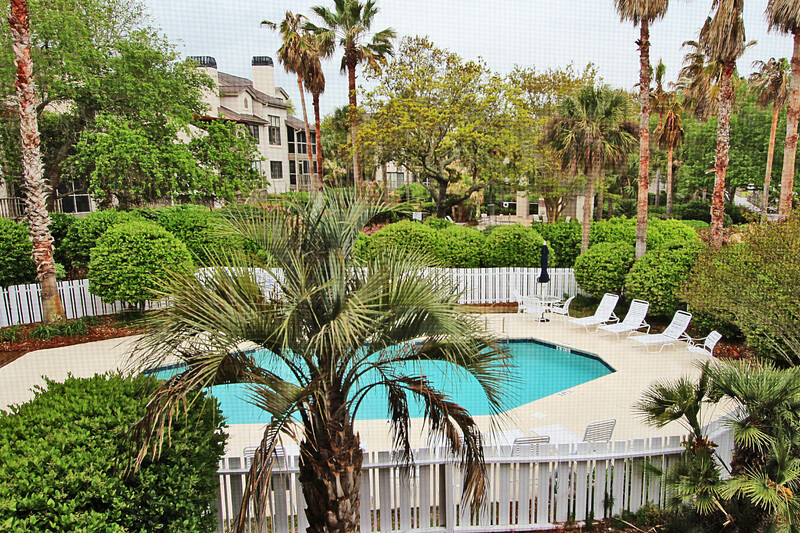 We enjoyed our stay at Moorings 509 in Wild Dunes very much. The location of the property was perfect and the complex and grounds were kept neat and clean at all times. The bathrooms could use some updating, but other than that, we were very pleased with this roomy and comfortable condo. We hope to stay there again in the future. The condos location is fantastic and has all the comforts of home. We loved our time in this beautiful condo. It was decorated absolutely beautiful and had everything that we needed and more for our stay. The Moorings community is very quiet and private. We enjoyed the pool located right outside the condo. The views were incredible. It is one of our favorite places that we have stayed and will definitely return. It's in a very beautiful location, and the condo is super nice, we loved it! I did not like the fact that VRBO charged $104 on top of the cost of the unit paid to Island Realty. So, will not book that way again. And, it is Charleston, SC, not SD. Beautiful spot in Isle of Palms! This condo was perfect for our family of 4, including two teenage boys. 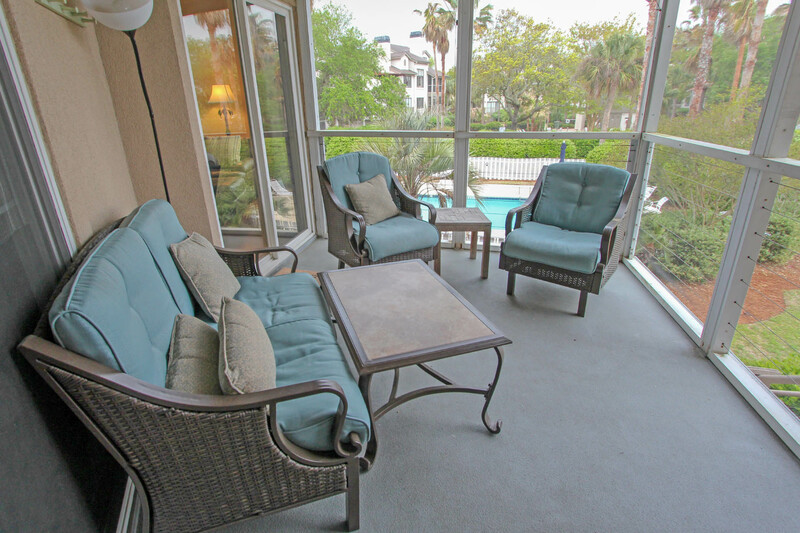 The pool is steps from the screened in porch, which has beautiful, peaceful view of the marina. Well decorated, super clean and kitchen well appointed. Great time, Island Realty is the best and only way to rent. The condo is quite comfortable, but the mattresses need replaced. The recent up grades are really nice and awsome sunsets. The condo has nice furniture and new refrigerator, stove and dishwasher. The counter tops looked new too. Kitchen was well equipped with cookware, dishes, etc. Kitchen, dining, and sitting areas were nice for entertaining some friends who came over for dinner. The master suite is large but the guest suite is smaller but does have separate bathroom. The porch featured in the ad did have some damaged screens which made use of the porch a bit buggy in the evening. Property manager got the screen fixed which was suprising considering it was a holiday week. The grounds and pool of the complex seemed well maintained. We used the grassy area as a staging area for a lowcountry shrimp boil.View of the boat harbor is nice. Overall we had a pretty nice time and enjoyed going to Spoleto events in Charleston. Perfect time away with perfect weather in the week before Memorial Day. Bike paths are great and the condo is quiet and well kept. Thank you so much for taking the time to share your experience. Your comments and feedback will be shared with the decision makers for Moorings 509. Your feedback is incredibly valuable to us and we sincerely thank you for your time and efforts. We hope to see you again soon! 509 for DEC. and Jan.
caulking in master bath is filthy around the tub, and should be replaced soon, and all the mattresses should be replaced. Unit was very noisy when other guests were up stairs in other unit. Would not rent this unit again for this reason. I just reviewed your recent guest survey from your stay in Ocean Blvd. Moorings 509 and I would like to thank you for taking the time to share your experience and apologize on behalf of Island Realty. I have reviewed all your feedback in detail and have also passed it on to the appropriate parties so they to can better understand the need for updating/renovating their unit. It is always Island Realty's goal to provide guests with quality accommodations, which I hate wasn't your situation during your recent stay. I hope that you know that every one of your suggestions or concerns are being looked at closely and shared with the decision maker of Moorings 509 in hopes to make this unit more appealing and comfortable for our future guests. Once again, thank you so very much for taking the time to share your experience with us! While our stay was brief (only two nights) we would definitely consider staying here again. We did provide prior input about a few minor maintenance issues that need addressing but overall this was a fine unit that met all of our needs. We stayed at 509 The Moorings for a long weekend to celebrate a big anniversary/birthday. We have stayed at numerous properties in Wild Dunes and this property will definitely stay on the return list. Spacious and quiet with high ceilings and great views. We felt like we had our own private pool! Hope to return some day. We liked the location and view from our rental. It was clean and comfortable. Walking path and pool right outside our door was very good too. Generally good for long weekend. Location great for what we needed. Condo needs some TLC. Jet tub mildew and needs repair (caulk/replace).Dryer start button broken. General dated fixtures/appliances. Bedding needs upgrade. Love Island Realty though! The condo is in a beautiful location located inside wild dunesto resort. It was very clean and spacious with a beautiful view. The staff was also very fast and efficient during the checkout process. We had a wonderful time in South Carolina and plan to return there next year. Stayed at Wild Dunes a few years ago and loved the area. Knowing we were attending a destination wedding, we decided to stay at Wild Dunes on Isle of Palms. Love the area. Beach roads can get crowded in the summer time but the beach and the area is worth it. The unit is approximately thirty (30) years old but clean. There were several maintenance issues but the property management was quick to respond to our needs. The screened in porch area needs some clean and repair. A little TLC would benefit the entire building on the outside. I would stay there again. My husband and I visited the area with 2 close friends for the weekend. The check in process was quick and easy and we were even able to check in early since the condo was ready. The condo itself is a lot more spacious than the pictures portray, and everything is in excellent condition. The pool was easily accessible from the back screened in porch. Linens are included and the king bed in the master bedroom is very comfortable. The condo is a little far away from Charleston, but if you want a quiet place this is it. I would definitely stay here again. Your Handling of the mail for renters needs to be improved. Our mail was placed in some one else's folder and we had to ask the desk clerk to check the other file holders, resulting in our mail getting to us 5 days late. This is our first time at 509 and have already rented for next year. A fabulous place with a quiet location and great views of the marina and sunsets. The condo is very comfortable and nicely furnished. Hope to continue our stay here and make this our winter home.